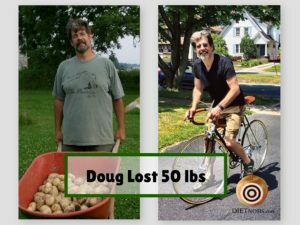 How did Doug Schmidt Lose 50 Pounds and Keep It Off? A Strong Husband and Wife Team! Doug, tell us about your weight loss journey. In 2008, at age 49, I had a heart attack and had a stent placed in my left anterior descending coronary artery. 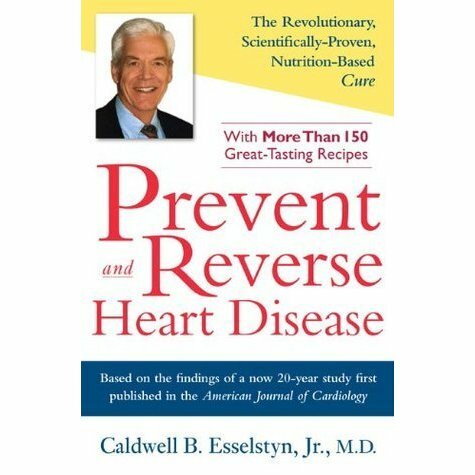 I found Dr. Esselstyn’s book Prevent and Reverse Heart disease. It seemed too extreme at the time. We started growing our own food and cut back on animal protein by having no pork or beef. A year later I had a scare and we dropped every meat except, fish. Then 2 years ago I had issues with statins. The whole time I was on statins my cholesterol numbers never came into line. My doctor and I decided to try using diet as the way to get my correct my numbers. I dropped the statins and went on a whole-foods plant-based (WFPB) diet with no oil. Then 2 years later I was able take no medicine. I’m not even on a daily aspirin. I have lost over 50 pounds. I weigh 173 and I am 5ft 10in. My energy level is through the roof and it feels like I found the fountain of youth. We follow the Dr. McDougall Starch Solution guidelines. My energy level is through the roof and it feels like I found the fountain of youth. Doug, what was your life like before you made your amazing transformation? Was there any specific event that sparked a change in you? I had gone through back surgery, a previous marriage of 24 years that ended in divorce and bankruptcy. The heart attack was a wake-up call an event that actually charged my resolve and will to live and beat this. Especially when I found that I could address my disease with diet. At the time weight loss was not my goal. I thought oh sure I have a few pounds to lose but I didn’t think I was as bad as most Americans my age. My wife mentioned the other day how when we started I hoped to get down to the 180’s in weight. That I thought that was a good for me. Now I am closing in on 170 and I haven’t seen that since high school and I think I can ratchet that down to 165. It wasn’t easy. The more we learned the more we cut out of our diet. At first we thought we could cheat here or there if we were doing so well everywhere else. We tell everyone it is a journey, a personal journey. The closer you move towards the ideal the healthier you will be and feel. It took us 8 years to get where we are. Now we try to help people learn from our mistakes and hopefully help them avoid our pitfalls. Where did you derive your motivation during your change? My drive was health related and not wanting to be on medications my whole life. What were the long-term effects of someone on these drugs starting to consume them in their 40’s. I didn’t want to be a statistic. Both my wife and I are individuals who seek truth and knowledge. Once we have that knowledge we can’t ignore it. Who was your “Social Support” network when you were making these changes? My wife was by my side the whole time. We did this together. With both of us we conquered each transition. Supporting each other, cooking together, digging up recipes and researching the science behind it. My wife took the eCornell course in plant based nutrition and my previous background in food service mainly in baking came in handy to adapt recipes to be compliant. My wife was by my side the whole time. Doug, what would you tell folks who are just starting out to do that will give them the confidence they need to face roadblocks, set-backs and naysayers? Read, read read. Maybe from the perspective of being a teacher the knowing is so important. When people ask me why am I doing this why can’t I do the Mediterranean diet or go Paleo I have the evidence and facts to back it up. 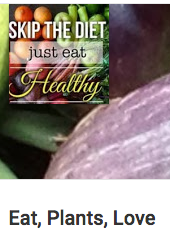 I am solid in my conviction that I am following the healthiest way of eating. I tell people I follow 5 doctors who all say the same thing and have been saying it for over 30 years each. Dr. T. Colin Campbell, Dr. Michael Greger, Dr. Caldwell Esselstyn and Dr. John McDougall. They have many peer reviewed articles. Armed with my defense against naysayers it makes it easy to ward off those that would try to sway me. Yes people do fall, but then they get back on the path. If health or weight loss is you main concern, then nothing will work better than this way of eating (WOE). This WOE also creates a gentler footprint on the Earth as well and for those who are aware of the harm they do to the planet this may have appeal, I know I sleep better at night. Armed with my defense against naysayers it makes it easy to ward off those that would try to sway me. Once you had formed good habits, what helped you avoiding relapsing back into old ways? Eating your favorite Standard American Diet (SAD) food, and then feeling ill for the next 2 days is a great deterrent to moving off the plan. The more amazing recipes we had under our belts, the more charged up it made us to try new foods. We were foodies before all this, and now we have expanded our palettes and eat things that 8 years ago we never would have touched. The flavors and tastes we create are so amazing. I think the hardest things Americans struggle with is vegetables. We don’t know really how to use them well. They have always been sides not main dishes. 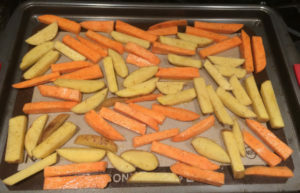 As our skills developed we began to avoid restaurants because we found ourselves cooking better than most restaurants and also could control our intake of what food we ate. We also began growing as much of our own food as we could in our short Northeast growing season. Also, after watching the 4 movies: Cowspiracy, Forks Over Knives, Earthlings and PlantPure Nation how could we eat anyway different? Tip 1: Seek out social media where you can draw inspiration. 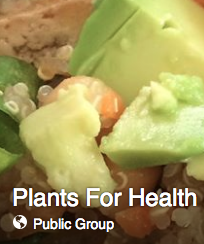 There are Facebook groups that cater to Whole Food Plant Based (WFPB) diets, recipes on Pinterest and even our newly started cooking videos on Youtube. 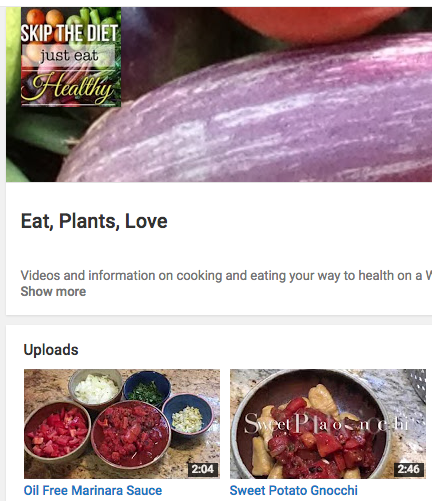 We created short videos to teach you skills and recipes. 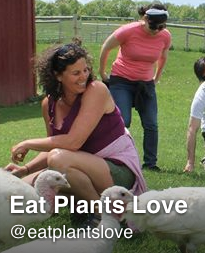 Go to: Eat, Plants, Love YouTube Channel. Tip 2: Find recipes that you just crave. These will be your go to recipes to help you stay on the path. Tip 3: Learn to cook, challenge yourself. Tip4: Read as much as you can from reputable sources. Weight loss for me was the side effect. For me I was looking for optimum health. The hardest things were letting go of what I call the Golden Cows. Those go to foods you adore like cheese, bacon, and for me anything baked. Doug, see this as a challenge to learn about foods and skills you have yet to experience. Once you turn down this road you will reach a place where you will no longer need any medicine. It is possible. 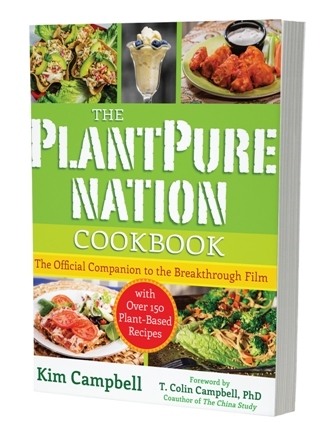 Kim Campbell Author of PlantPure Nation Cookbook. She does amazing things with food that are easy and at the same time familiar. Her cookbook has caused us to look as food possibilities in a different light. 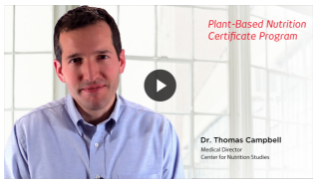 I refer people to Dr. Michael Greger’s site Nutrition Facts.org is our quick go to plant-based medical refereence site. He cuts through the medical jargon, gives you just the facts and not the hype. Baked goods. I was a baker and can bake anything. I also have a sweet tooth. Overtime it has become easier and easier. I just look to make delicious baked goods a bit differently now. Favorite food products: Balsamic Vinegar, Smoked Paprika and fresh garlic (we grow our own). Favorite cooking product: Silpat silicon baking sheets. I bought them over 25 years ago before they were ever in the states. I bought new ones last year we use them every week if not almost every day alongside our 3 cast iron pans. Where can people learn more about your story? They can reach my wife Shari and I at [email protected]. We are beginning to work on a blog and hoping to also write a book about my journey from heart attack to heart attack proof this summer. Thank you Doug for your insight. By telling your story, you are helping people to take control of their health. I look forward to checking out your upcoming blog and more of your videos. Keep up the good work. Dr. Scott Harrington 3 July 2016.